Row1 and Row 2, left to right: Christian Hinegardner, Katherine Fischer, Jaden Peeks, Morgan Ross, Kyra Rottgen, Emma Winchester, Morgan Saul, Breckyn O’Shea, Emmy Smith, Ali Bush, Izzy Caraway, Maddie Hardwick. Row 3 and Row 4, left to right: Julia Presley, Abigail Brown, Emma Sluterbeck, Jenna Fickes, Emily Frantz, Naomi Admasu, David Richards, Eric Woods, Jalen Ruby, David Vennemeyer, Isaiah Underwood, Austin Smith, Nick Sanders. 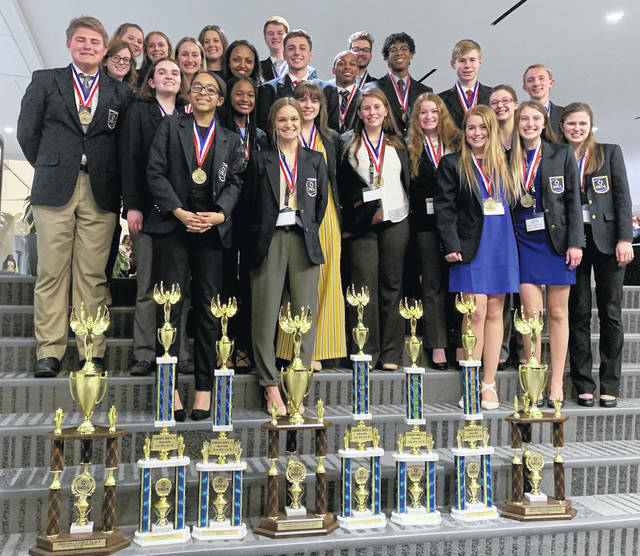 COLUMBUS — Last weekend 43 Northmont DECA members traveled to Columbus for the 2019 Ohio DECA Career Development Conference to compete against nearly 1,800 students around the state of Ohio and earn a spot to attend the International Career Development Conference in Orlando, Florida at the end of the April.